Traditionally, wallpaper is applied to walls, and ceilings are painted a boring shade of white. Why not reverse the trend and apply wallpaper directly to the ceiling? 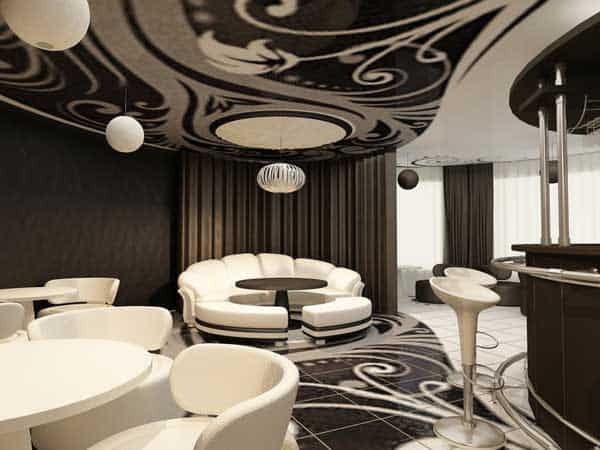 Think of the ceiling as a fifth wall; turn it into a focal point, and you’ll end up with a dynamic and energetic space. When buying wallpaper for ceilings, look for random patterns – think swirling lines and paisley prints. Geometric prints like stripes and checks will only highlight crooked walls and lopsided ceilings. Make sure the ceiling is completely smooth, since wallpaper won’t stick to textured surfaces. And if you have a hard time applying wallpaper to walls, you’ll find it downright impossible to apply wallpaper to a ceiling; consider hiring a professional for the job. Plain white bookshelves don’t add much interest to a space. If you want to make a design statement, install wallpaper on the back panel of a bookcase. A wallpapered bookcase will draw attention, in turn becoming the focal point of a living room or den. If your bookshelves are piled high with books, choose a wallpaper with a bold print; the books will cover most of the wallpaper, so you want what little wallpaper shows to make an impact. If, on the other hand, mismatched accessories crowd your bookshelves, use wallpaper to calm the clashing colors. 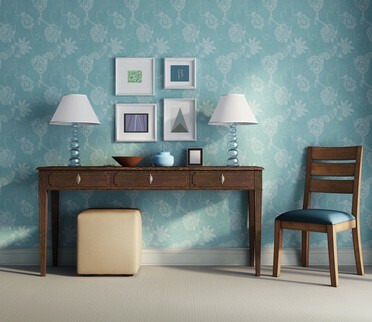 You can unite your disparate collections by choosing a wallpaper pattern in the same color scheme as your accessories. Original artwork can set you back thousands of dollars. Store-bought replications of original artwork can cost hundreds of dollars. If your artwork budget is in the tens-of-dollars range, consider framing wallpaper. Many modern wallpaper designs are intricate, complex, and downright busy. The patterns might seem overwhelming in large doses. But when used sparingly, installed in a simple white or silver frame, these wallpaper designs are beautiful and elegant. To stick to your budget, find out if your local paint or hardware store sells wallpaper by the foot; if not, ask if you can purchase a wallpaper sample in the same dimensions as your frame. Wallpaper is versatile; it looks good no matter how you use it. So when you find a print you like, look beyond your four walls to find new uses for it. Whether you apply it to your ceiling, bookshelves, or picture frames, wallpaper will add interest and beauty to your home. This is one design trend you won’t want to strip from your home.